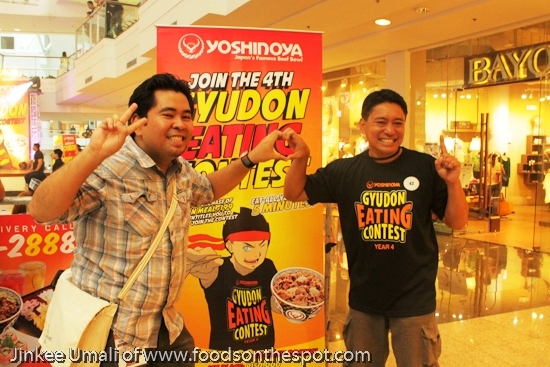 Last June 14, we accompanied hubby Ruel Umali of www.ruelumali.com for the Yoshinoya‘s 4th Gyudon Eating Contest at the Glorietta Activity Center, Makati City. As a recall, it was coincidence when he joined the contest – not a plan actually. 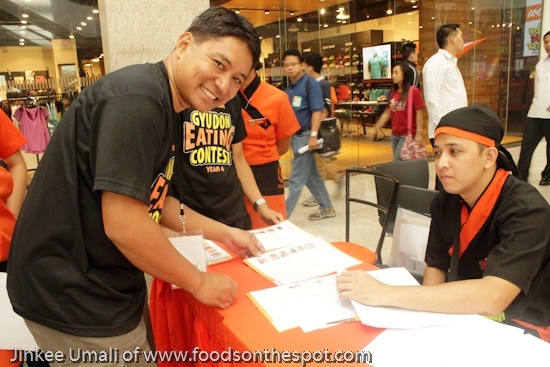 He thought he will just be covering an event like a taste of new food offering. 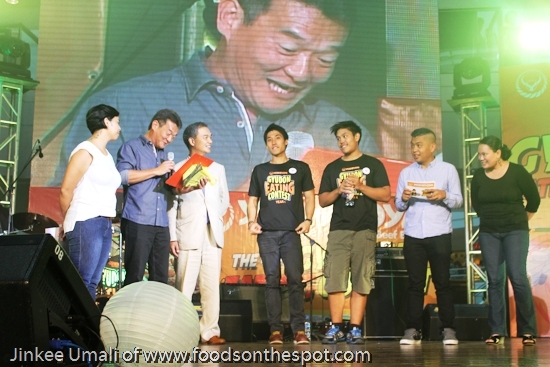 He never imagined it would be an eating contest and hailed as a winner that would represent the online media. Read more his share on this link. He was also welcome and supported by blogger friends. 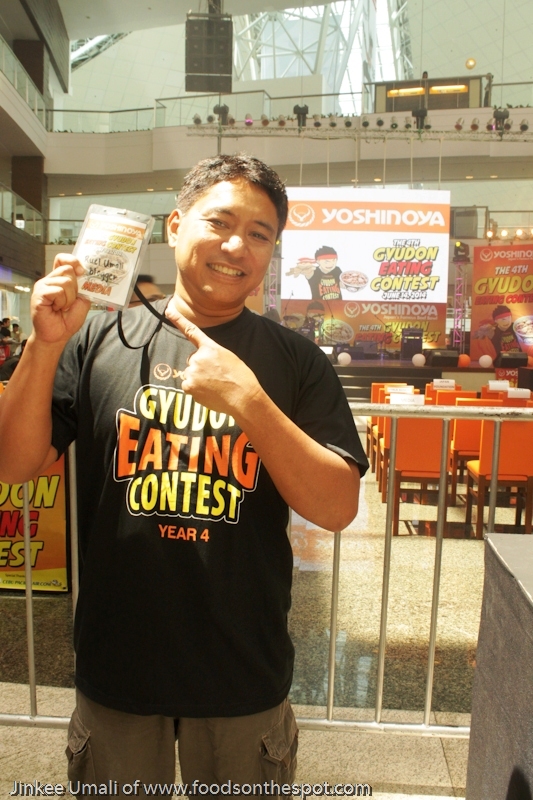 Even last year’s winner for the media challenge, Florencio Jusay Jr. were there to give those good luck charm. 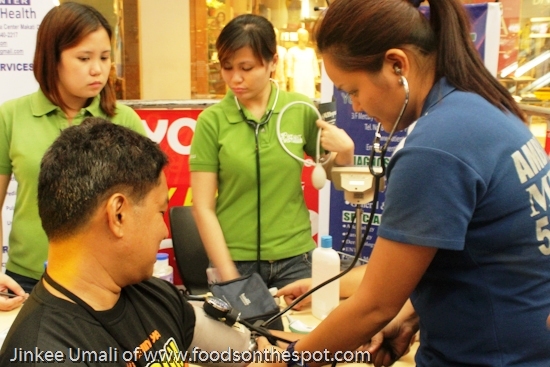 For 6 weeks preparation all over their branches in Metro Manila, 46 participants were gathered together that won the qualifying rounds and will be included as contestants for the grand finals. 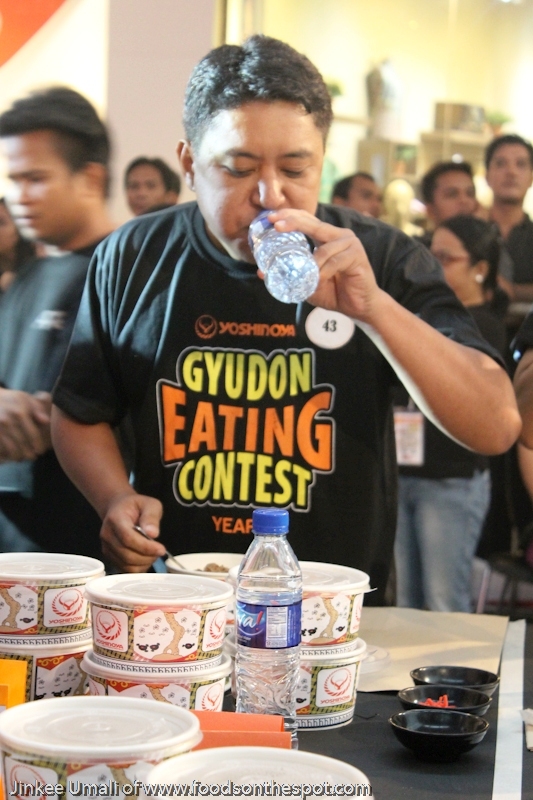 It was the same thing, in order to be a winner, a contestant must eat the most number of gyudon bowls in 15 minutes. 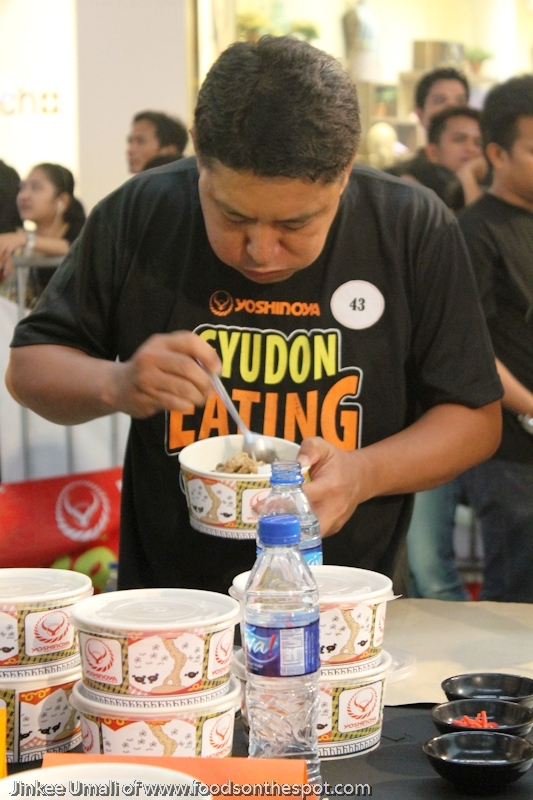 As all the 46 contestants were doing registration and physically examined one by one, Yoshinoya prepared activities for the audience and won prizes from the event partners like Cebu Pacific and Mogu Mogu. 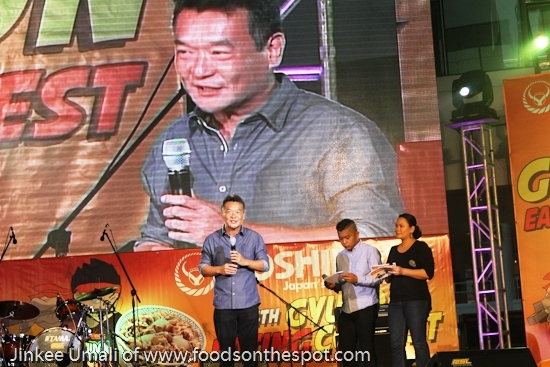 Mr. Timothy James G. Yang of Yoshinoya Century Pacific, Inc. President and General Manager is also present to welcome all the participants and grace the said event. Separated from the contestants were 4 representing the media – from radio, prints, online and TV. 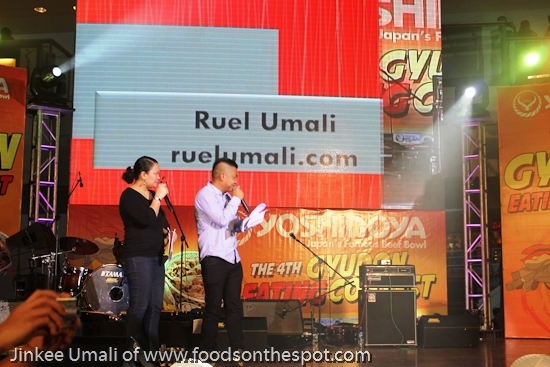 There were only two who came – one was Ruel from online and Romel Balbin of UNTV representing TV. 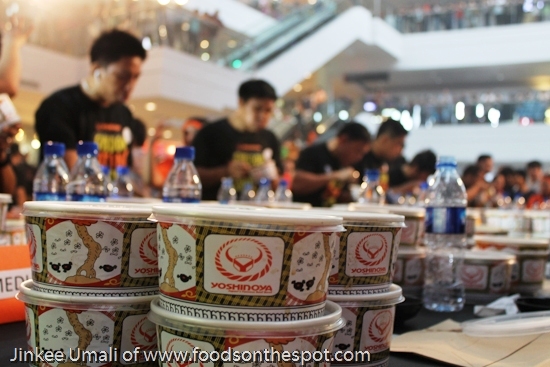 They will also compete the same rule – finishing most numbered gyudon bowls in 15 minutes. 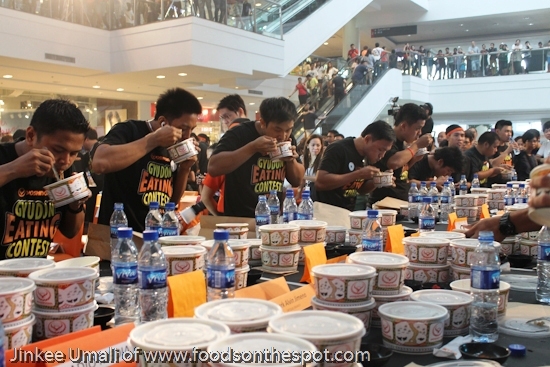 This was my first time to see an actual eating contest. It was exciting and quite there was a tension knowing a contestant is close to you. LOL! Anyway, all have their own tactics to win. Actually, I can only finished half of gyudon bowl even I am hungry. Hubby was separating his gyudon to rice and munch all the rice first while cutting those beef one by one for easy chewing. He was more finesse compared to others who were eating voraciously. LOL! Anyway, this is an eating contest. 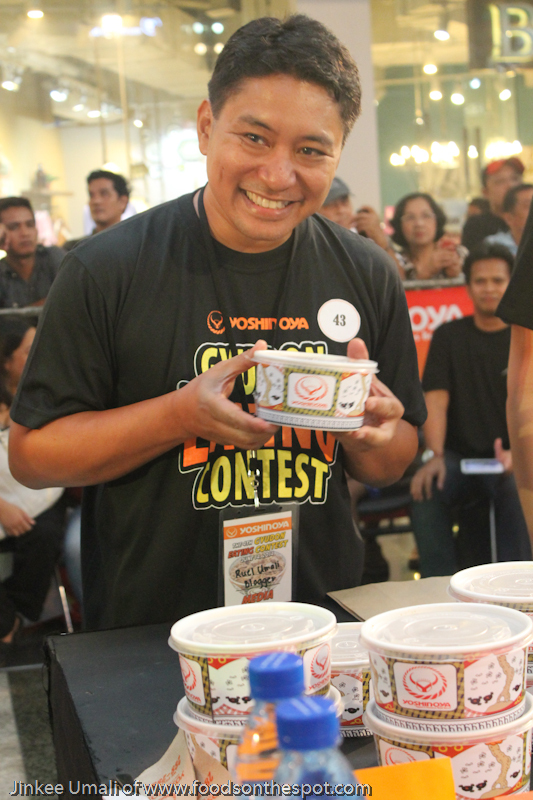 For the media, Romel Balbin of UNTV won with 3 and half bowls bringing P 50,000.00 cash prize, trip to Japan and a cellphone. This year’s prizes got even better—and bigger—especially for the First Place winner, who received P150,000 in cash and a round trip ticket to Japan courtesy of Cebu Pacific which Mr. Zermatt Liang Zhaoyuan won the competition. 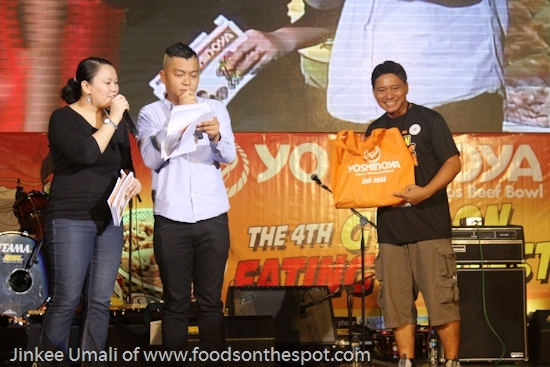 Brendon Viernes came in 2nd place, winning Php 50,000 and other prizes. 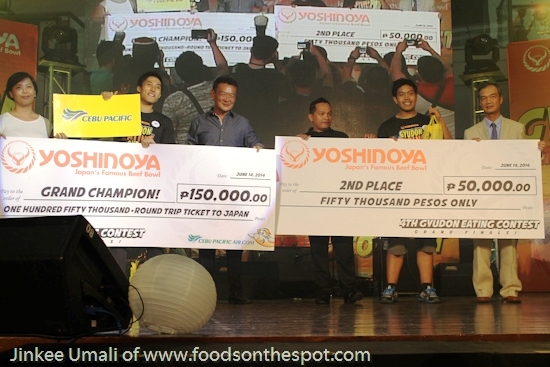 Wayne Algenio finished 3rd place, winning Php 25,000 and other prizes. 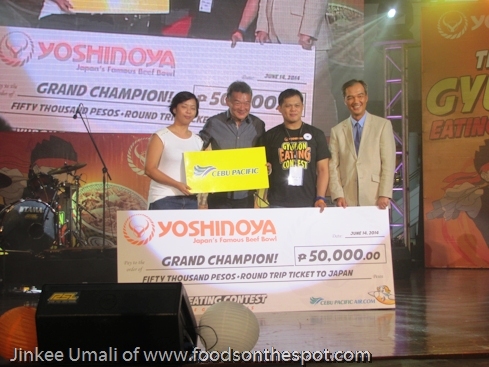 For the non-winners, they were given a consolation prize of P2,000 worth of Yoshinoya gift certificates. 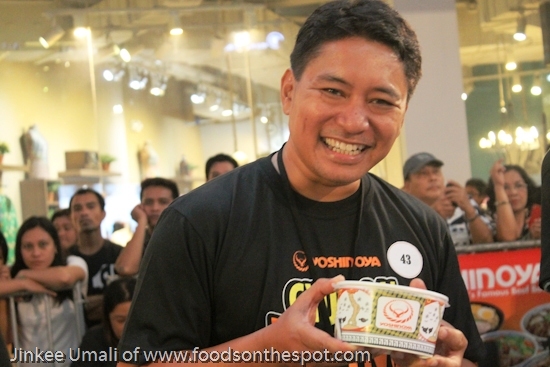 Hubby, Ruel Umali only had 3 bowls finished. Well, it was quite a regret for half bowl difference from his competitor. Still for us, it doesn’t matter because win or lose, most important thing one enjoys it as I am proud of him. Hubby is such a private person. Getting out his shell to join this kind of contest is good enough not only for us but also for him. What more, there are so much lessons to learn to be competitive in every challenges and that matters most. It was a bliss of fun as family also were there to support hubby. 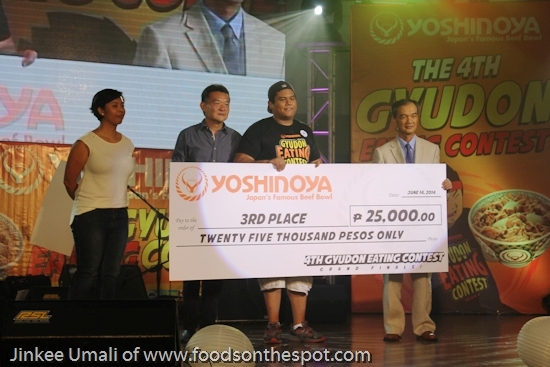 Will be anticipating the next Yoshinoya contest next year, the 5th Yoshinoya Gyudon Eating Contest and hopefully, this would also be a successful yet fun to all the participants. 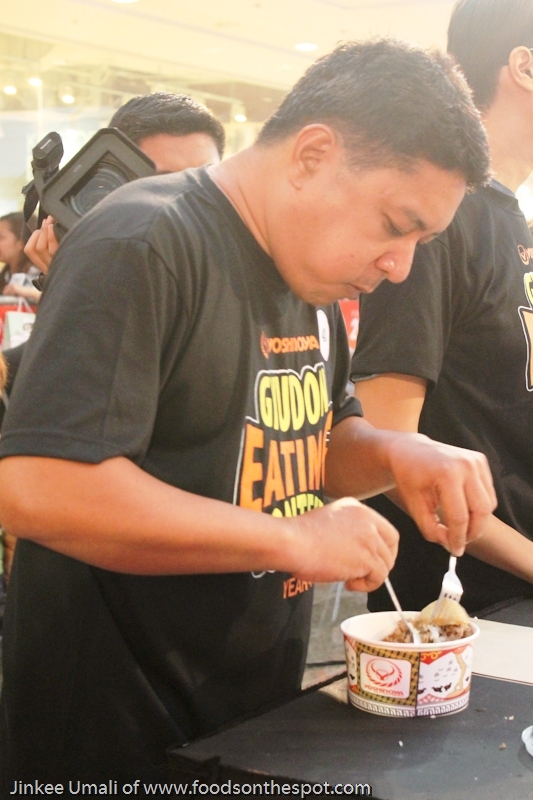 I’ve seen how sir Ruel finished his bowls of beef gyudon without much effort–during the bloggers’ round. He really didn’t think he’d win because there were others who were more competitive and agressive than he was. But it’s meant for him to represent us during the finals. 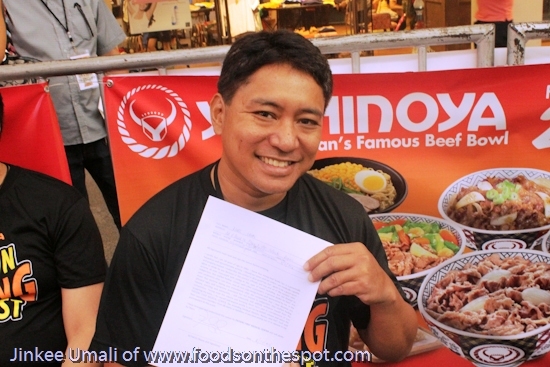 He may not have won the top prize, but as a blogger, we’re still proud that it was him who represented us. He fought the battle with all his might, what with a half bowl difference, there’s always a next time! Congrats pa rin kay Sir Ruel! I’m sure he’s had a great time and had a wonderful experience! Thanks Vance for dropping by and boost wisdom. It’s his first time to join such event. He is both excited and tense, I suppose. I think he enjoyed it especially the experience. Whaha yeah it does not matter if he wins or loses. 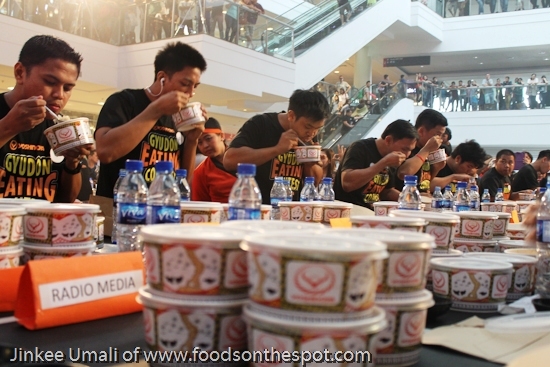 What counts if the experience to be able to join such an eating contest. Yup Roch, I reminded him also in joining this contest. It is not really winning but more on experience learn. I don’t think I can ever win an eating contest, but this one really has big prizes! Trip to Japan, wow! 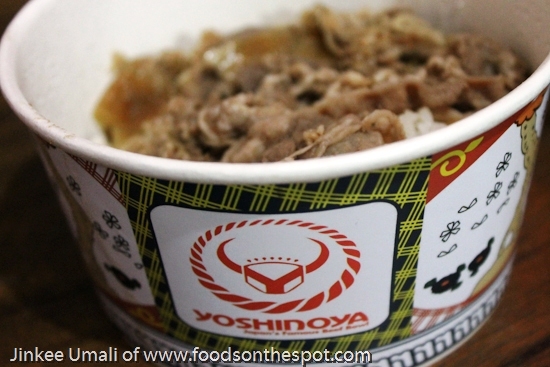 And this Yoshinoya gyudon is a favorite of our whole family. Good thing, I was not there on the contest proper before, because definitely I will not win. I will just enjoy eating the beef bowl. I don’t think I can do good in this one as even if it I can eat fast. I feel full easily. Yah, I feel you Franc. I got full easily on the food I eat but always eat.